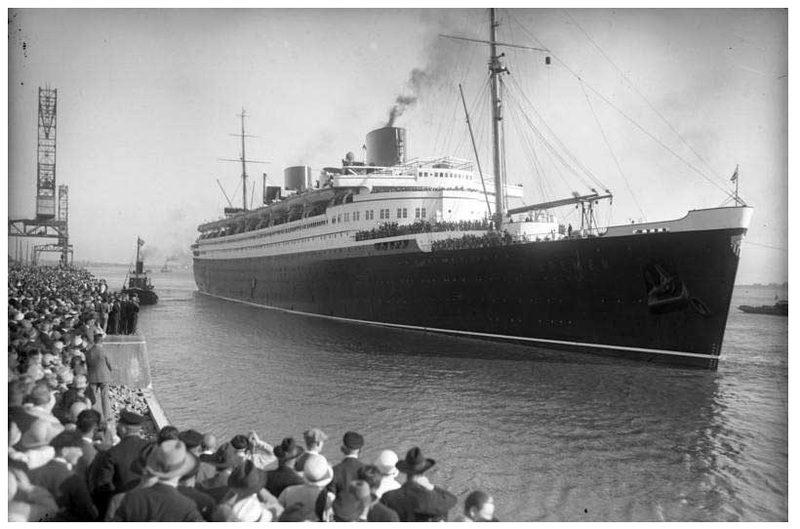 Home / CRUISING THE PAST / 1936 German/Nazi Olympics were a destination aboard ships of the North German Lloyd Line. For two weeks in August 1936, Adolf Hitler’s Nazi dictatorship camouflaged its racist, militaristic character while hosting the Summer Olympics. 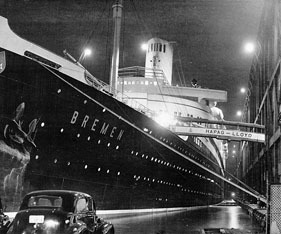 Midnight sailings were offered on the liners Bremen and Europa. 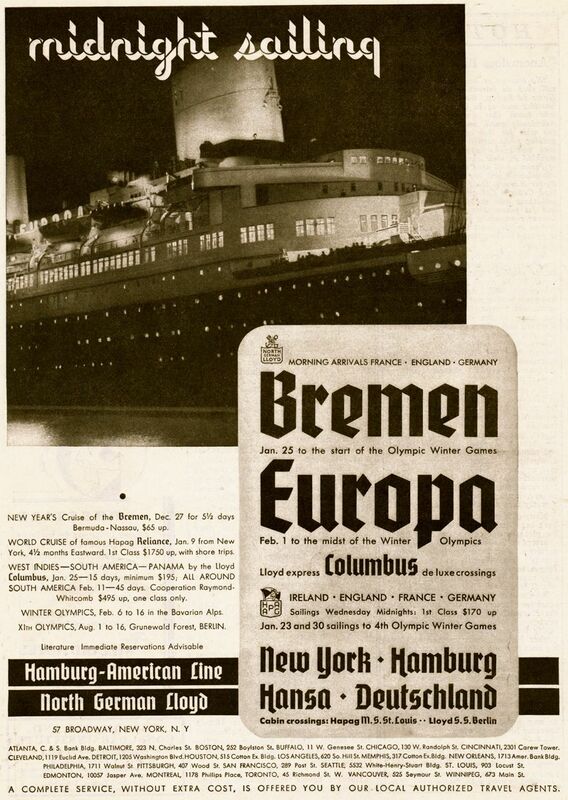 This ad appearing in the Literary Digest (1936) exploits the Winter and Summer Olympics with service aboard North German Lloyd liners the EUROPA and BREMEN available from New York with a Midnight Sailing. These departure times, guaranteed morning arrivals in European ports. Round-trip first class fares started at $215. For two weeks in August 1936, Adolf Hitler’s Nazi dictatorship camouflaged its racist, militaristic character while hosting the Summer Olympics. Minimizing its antisemitic agenda and plans for territorial expansion, the regime exploited the Games to impress many foreign spectators and journalists with an image of a peaceful, tolerant Germany. Dedicated to the great passenger liner BREMEN, the ship that took the Blue Riband from the mighty RMS Mauritania in 1929. The BREMEN was set afire by a drunken sailor in 1941 while berthed in Bremerhaven during World War 2. 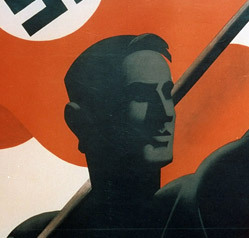 Having rejected a proposed boycott of the 1936 Olympics, the United States and other western democracies missed the opportunity to take a stand that contemporary observers claimed might have restrained Hitler and bolstered international resistance to Nazi tyranny. Thousands of Americans sailed to Germany on German and American ships to attend the Olympics. After the Olympics, Germany’s expansionism and the persecution of Jews and other “enemies of the state” accelerated, culminating in World War II and the Holocaust. Thousands of enthralled sightseers in New York greeted the BREMEN in July 1929 – when it won the coveted blue ribbon for crossing the Atlantic.. The BREMEN and EUROPA signaled a resurgence of Germany after the horrific defeat of WW 1. When the Nazis came to power in 1933 they used their fabulous growing fleet of ocean liners to carry their flag to ports around the world. In 1935, before one voyage from New York, a group of protesters stormed the BREMEN and ripped the Nazi flag from the ship and tossed it into the Hudson River. In retaliation Hitler ordered the Nazi banner to be the exclusive flag of Germany. Previous: The TSS AWATEA (Union Steamship Company overtakes the SS MARIPOSA (Matson Lines) – August 1938….